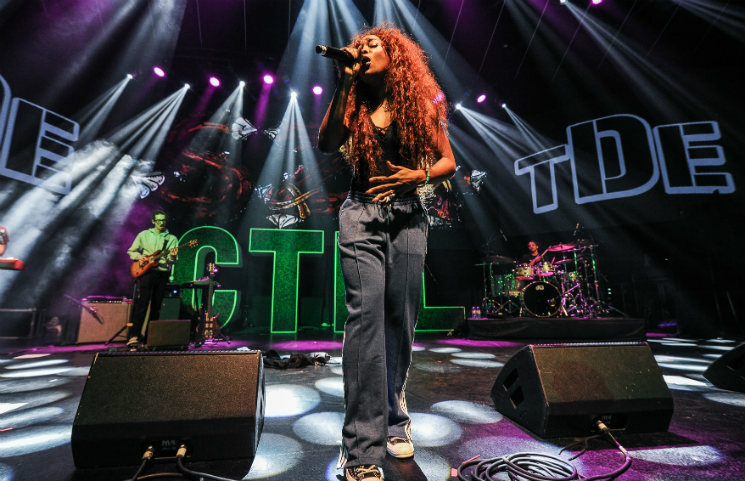 SZA and her Top Dawg Entertainment labelmates like Kendrick Lamar, ScHoolboy Q, Ab-Soul and Jay Rock are currently in the midst of "The Championship Tour," but it seems the Ctrl singer will have to miss a few upcoming stops. TDE boss Anthony Tiffith released a message on social media last night (May 22) informing fans that SZA would have to pull out of some upcoming shows on doctor's orders. "Her vocal chords are swollen and she have to rest her voice to prevent any permanent damage," he tweeted, explaining why she missed the recent shows in Arizona and New Mexico. SZA is expected to see the doctor again in a few days, after which Tiffith will give fans another update. He also promised that "we'll figure out a way to make it up to you guys." "The Championship Tour" is slated to hit Toronto on June 12. See the remaining stops listed below, and stay tuned for (hopefully positive) updates on SZA's touring status.